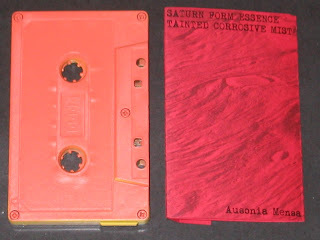 Format: C60 cassette release on the Puzzle Records label (Germany) in November 2010, cat ref #63. 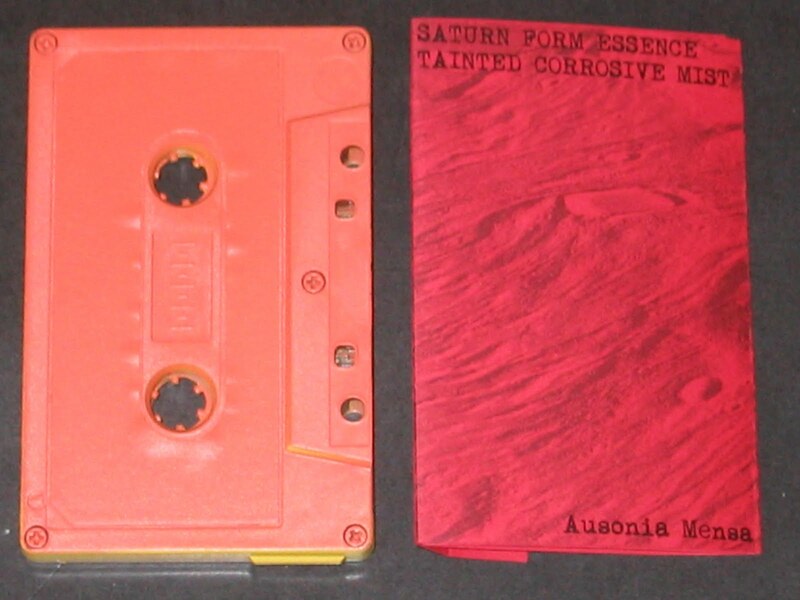 A split tape between Saturn Form Essence and Tainted Corrosive Mist (Germany). 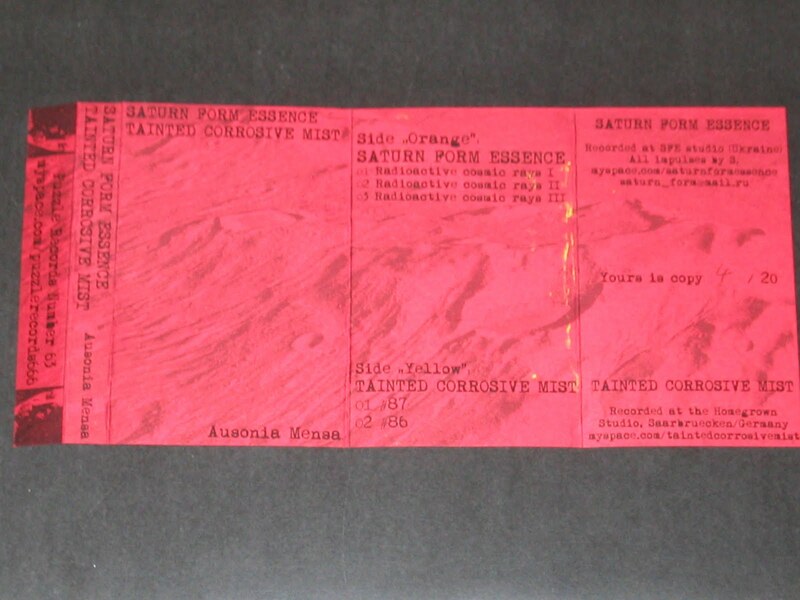 Comes with a folded card inlay and a 2-colour spray-painted cassette. 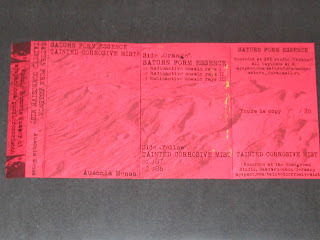 These radioactive emanations are not unique to this split tape, and appear on a few other CDr and tape releases in the SFE discography. However, it's the first time that we've encountered them on our travels so a quick word on each track. Part I is the most ethereal of the three, almost ecclesiastical at times in the sense of giving a true sense of music within a vast space, akin to sounds disappearing in the rafters of an enormous cathedral. Dreamy and ambient, it's a very easy listen. Part II has more of a sense of (hyper)drive to it, possessing waves of sound flowing over the listener, punctuated by short bursts of static, the occasional click and some brief periods of white noise/silence. There is a more noticeable keyboard melody throughout the piece, which again makes it an easy listen but with plenty of variety on offer throughout its drones. Part III is the shortest piece, and continues the sense of waves of music pulsing through the cosmic reaches and finally coming back to Earth via your speakers. If you were wondering, Ausonia Mensa is a massif in the Hellas quadrangle of Mars, located at 30.3° S and 262.3° W. It is 103 km across and was named after an albedo feature name. Ausonia Mensa has many small channels and is covered in impact craters, with some features look like alluvial fans. A large remnant mountain exists in the Hesperia Planum region, covering an area of 98 by 48 kilometres and has an elevation of 3700 metres. Ausonia Mensa doubtless offers the perfect location for inspiration and reflection, which is also an opportunity offered through this meditative performance from our favourite Ukrainian project. Recommended.